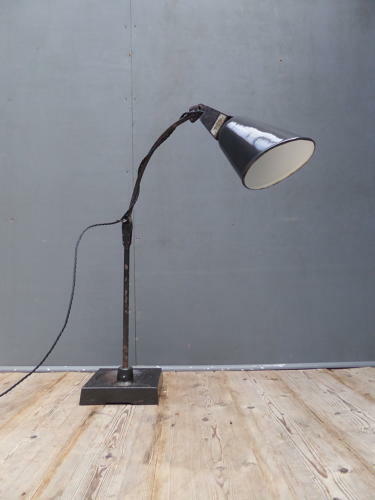 A fantastic example of a vintage industrial lamp by Walligraph. A wonderful industrial lamp of fantastic form with a large, heavy cast iron base and articulated arm supporting its original tapered black & white enamel shade. In original factory paintwork which boasts a good age related patina. Wear commensurate with age, very good overall. Height measurement refers to the lamp in the main image. UK courier service available at £14, tracked & signed for 24 hour delivery.